Since the early 1900s, people have been drawn to the classical miniature golf course, with fountains, gardens, walkways and pitch and putts. Crazy obstacles were added to courses built after the Great Depression, and today's popular game of mini golf was born. 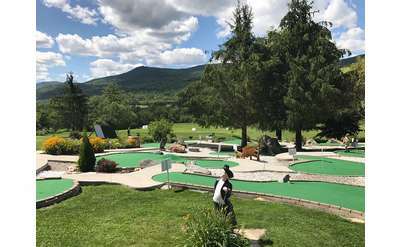 The Adirondack's mini golf courses offer today's visitors and residents all the fun and challenge this traditional game delivers. Spend a couple hours trying to sink a hole-in-one at one of the following mini golf courses. Looking for a great place to practice your swing and play a round of miniature golf with the family? Visit Five Nations Golf, a comprehensive golf center located on the northern end of Lake George in Ticonderoga, NY.